Smartphones help users navigate the world around them, from turn-by-turn driving directions to assistance with public transit. This is especially true for younger users. An “experience sampling” of smartphone owners over the course of a week illustrates how young adults have deeply embedded mobile devices into the daily contours of their lives. The experience sampling survey illustrates that smartphone usage often produces feelings of productivity and happiness, but that many users also feel distracted or frustrated after mobile screen encounters. 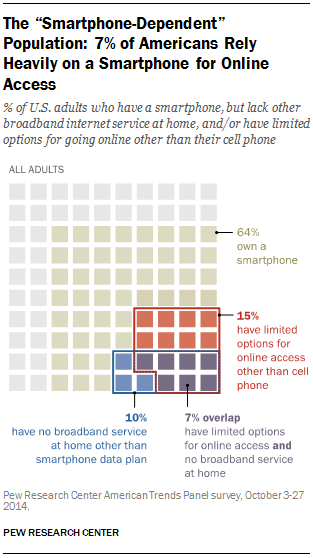 Indeed, 7% of Americans own a smartphone but have neither traditional broadband service at home, nor easily available alternatives for going online other than their cell phone. This report documents the unique circumstances of this “smartphone-dependent” population, and also explores the ways in which smartphone owners use their phones to engage in a wide range of activities. 64% of American adults now own a smartphone of some kind, up from 35% in the spring of 2011. Smartphone ownership is especially high among younger Americans, as well as those with relatively high income and education levels. 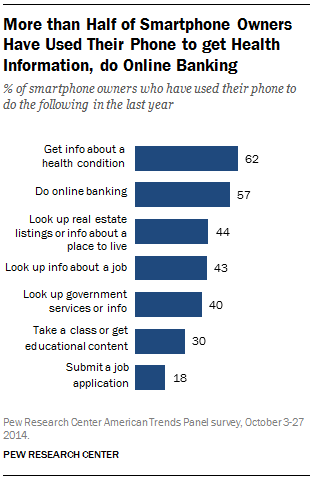 Using a broader measure of the access options available to them, 15% of Americans own a smartphone but say that they have a limited number of ways to get online other than their cell phone. In all, one-in-five American adults (19%) indicate that at least one of those conditions apply to them, and 7% of the public says that both of these conditions apply — that is, they do not have broadband access at home, and also have relatively few options for getting online other than their cell phone. 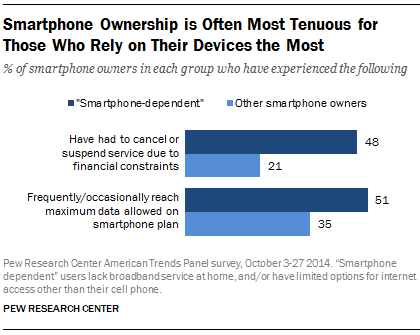 Throughout this report, we refer to this latter group as “smartphone-dependent” users. Younger adults — 15% of Americans ages 18-29 are heavily dependent on a smartphone for online access. Those with low household incomes and levels of educational attainment — Some 13% of Americans with an annual household income of less than $30,000 per year are smartphone-dependent. Just 1% of Americans from households earning more than $75,000 per year rely on their smartphones to a similar degree for online access. Non-whites — 12% of African Americans and 13% of Latinos are smartphone-dependent, compared with 4% of whites. 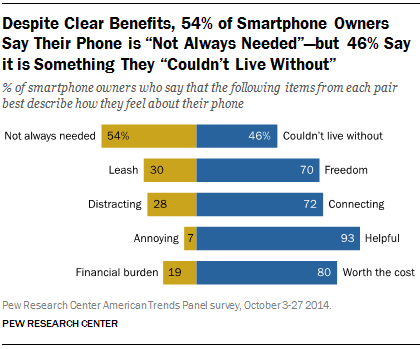 Compared with smartphone owners who are less reliant on their mobile devices, these smartphone-dependent users are less likely to own some other type of computing device, less likely to have a bank account, less likely to be covered by health insurance, and more likely to rent or to live with a friend or family member rather than own their own home. Even as a substantial minority of Americans indicate that their phone plays a central role in their ability to access digital services and online content, for many users this access is often intermittent due to a combination of financial stresses and technical constraints. Nearly half (48%) of smartphone-dependent Americans have had to cancel or shut off their cell phone service for a period of time because the cost of maintaining that service was a financial hardship. In addition, 30% of smartphone-dependent Americans say that they “frequently” reach the maximum amount of data that they are allowed to consume as part of their cell phone plan, and 51% say that this happens to them at least occasionally. Each of these figures is substantially higher than those reported by smartphone owners with more access options at their disposal. Lower-income smartphone owners are especially likely to use their phone during a job search. Compared with smartphone owners from households earning $75,000 or more per year, those from households earning less than $30,000 annually are nearly twice as likely to use a smartphone to look for information about a job — and more than four times as likely to use their phone to actually submit a job application. Similarly, “smartphone-dependent” users are much more likely to use their smartphones to access career opportunities. 63% of these smartphone-dependent users have gotten job information on their phone in the last year, and 39% have used their phone to submit a job application. Young adults (85% of whom are smartphone owners) are also incorporating their mobile devices into a host of information seeking and transactional behaviors. About three-quarters of 18-29 year old smartphone owners have used their phone in the last year to get information about a health condition; about seven-in-ten have used their phone to do online banking or to look up information about job; 44% have consumed educational content on their phone; and 34% have used their phone to apply for a job. 67% use their phone to share pictures, videos, or commentary about events happening in their community, with 35% doing so frequently. Each of these behaviors is common across a diverse group of smartphone owners. Mobile news consumption is common even among older smartphone owners, who tend to use these devices for more basic activities. Four-in-ten smartphone owners ages 65 and older use their phone at least occasionally to keep up with breaking news, half use it to share information about local happenings, and one-third use it to stay abreast of events and activities in their community. 11% use their phone at least occasionally to reserve a taxi or car service. Just 4% do so frequently, and 72% of smartphone owners never use their phone for this purpose. Each of these behaviors is especially prevalent among younger smartphone owners: for instance, 17% of smartphone owners ages 18-29 use their phone to reserve a taxi or car service at least occasionally. Additionally, African American and Latino smartphone owners look up public transit information on their phones at higher rates than whites (37% of black smartphone owners, 30% of Latinos, and 21% of whites do this at least on occasion). In addition to the surveys of smartphone owners that form the main findings of this report, the Pew Research Center also conducted an “experience sampling” survey of smartphone owners as part of this project. In the experience sampling survey, smartphone owners were contacted twice a day over a period of one week and asked how they had used their phone in the hour prior to taking the survey. This analysis offers new insights into how smartphone owners interact with their mobile devices on a day-to-day basis: the features and apps they use; the locations where that use happens; the issues or problems they use their phones to solve; and the emotions they feel as a result. Fully 97% of smartphone owners used text messaging at least once over the course of the study period, making it the most widely-used basic feature or app; it is also the feature that is used most frequently, as the smartphone owners in this study reported having used text messaging in the past hour in an average of seven surveys (out of a maximum total of 14 across the one-week study period). Younger smartphone owners are especially avid users of text messaging, but this group has by no means abandoned voice calls — 93% of smartphone owners ages 18-29 used voice or video calling on at least one occasion during the study period, and reported doing so in an average of 3.9 surveys. Email has long ranked as one of the most common activities that users take part in online since the desktop/laptop era, and it continues to play a prominent role in the mobile era as well. Some 88% of smartphone owners used email on their phone at least once over the course of the study period, making email a more widely-used smartphone feature than social networking, watching video, or using maps and navigation, among others. Three smartphone features in particular — social networking, watching video, and listening to music or podcasts — are especially popular with younger users. Fully 91% of smartphone owners ages 18-29 used social networking on their phone at least once over the course of the study period, compared with 55% of those 50 and older (a 36-point difference). These young smartphone owners reported using social networking in an average of 5.6 surveys, tied with internet use as the second-most frequent smartphone behavior among young adults after text messaging. Features such as watching video and listening to music or podcasts are even more the domain of young smartphone owners. Three-quarters of younger smartphone owners (75%) indicated using their phone to watch videos at least once over the study period, compared with 31% of those 50 and older (a difference of 44 percentage points). And 64% of younger adults used their phones at one time or another to listen to music or podcasts — a 43-point difference compared with the 21% of older users who did so. 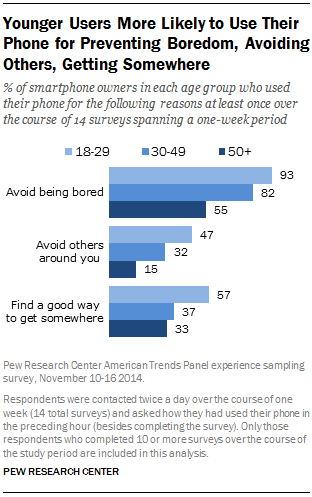 Younger users stand out especially prominently when it comes to using their phone for two purposes in particular: avoiding boredom, and avoiding people around them. Fully 93% of 18-29 year old smartphone owners in the experience sampling study used their phone at least once to avoid being bored, with respondents in this age group reporting that they did so in average of 5.4 surveys over the one-week study period. Similarly, 47% of young smartphone owners used their phone to avoid interacting with the people around them at least once during the study period, roughly three times the proportion of older smartphone owners who did so. This report is based on data from three different sources, each of which is discussed in more detail below. Basic findings on smartphone ownership and demographics within the U.S. adult population (the first section of Chapter One) are based on telephone surveys conducted December 4-7 and 18-21, 2014 among 2,002 adults. These figures for overall smartphone ownership/usage were collected via telephone survey to make them consistent with past Pew Research Center measurements of smartphone adoption. The margin of error for the total sample of 2,002 adults is plus or minus 2.5 percentage points. For more details about this survey, see Appendix A. Findings about how smartphone owners use their phones (the remainder of Chapter One, and Chapter Two) are drawn from the October wave of the American Trends Panel, conducted October 3-27, 2014 among 3,181 respondents (2,875 by Web and 306 by mail), including 2,188 smartphone owners. The margin of sampling error for the total sample of 2,188 smartphone owners is plus or minus 2.7 percentage points. For more details about this survey, see Appendix B. Data about how smartphone owners use their phones over the course of one week (Chapter 3) is taken from the American Trends Panel “experience sampling” survey, conducted November 10-16, 2014 among 1,635 respondents. Respondents were asked to complete two surveys per day for seven days (14 in total), using either an app they had installed on their phone (n=697) or by completing a web survey (n=938). All findings in this report are based on respondents who completed 10 or more surveys over the course of the week-long study period (n=1,035). The margin of sampling error for smartphone owners who completed 10 or more surveys is plus or minus 4.0 percentage points. For more details about this survey, see Appendix C.